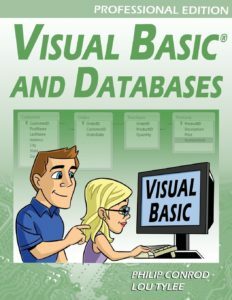 VISUAL BASIC AND DATABASES – PROFESSIONAL EDITION ​(Table of Contents) is a tutorial that provides a detailed introduction to using Visual Basic for accessing and maintaining databases for desktop applications. Topics covered include: database structure, database design, Visual Basic project building, ADO .NET data objects (connection, data adapter, command, data table), data bound controls, proper interface design, structured query language (SQL), creating databases using Access, SQL Server and ADOX, and database reports. Actual projects developed include a books tracking system, a sales invoicing program, a home inventory system and a daily weather monitor (Project Screenshots). VISUAL BASIC AND DATABASES is presented using a combination of over 850 pages of FULL-COLOR self-study notes and actual Visual Basic examples. No previous experience working with databases is presumed. It is assumed, however, that users of the product are familiar with the Visual Basic environment and the steps involved in building a Visual Basic application (such training can be gained from our LEARN VISUAL BASIC ​course).